Are you reading this at work right now with your company or organization’s desktop? Or are you at home reading it with your laptop? Possibly you are on the metro with your tablet or in a coffee shop with your smart phone. Wherever you are, I know you are reading it from some kind of electronic device. How old is your device? I bought my laptop last Thanksgiving, while Chris Weiss, here at DCEN, is working on a refurbished desktop that he bought three months ago. My husband has had his iPhone 4s for three years (as of this month); while my cousin is frantically awaiting her cell phone upgrade coming next month. It is no secret that technological advancements are increasing exponentially, while many Americans desire to have the newest electronic toy available. SellCell, an electronics trade-in website, stated that “consumers are trading in their iPads and other tablets at an ‘unprecedented rate’ to buy the newest offerings from Apple, Google, and Microsoft.” For those who are frugal, once their electronics do break down, they find that it cheaper and a better value to buy a new one than repair the old. So, where do we go from here? How can we best improve E-Recycling in our communities? Currently, there are 25 states that have passed E-Recycling laws. Washington D.C. has joined the trend, passing Bill 20-641, the “Sustainable Solid Waste Management Amendment Act of 2014”, which, among other things, will make it illegal to dispose of electronics in the trash by 2018. 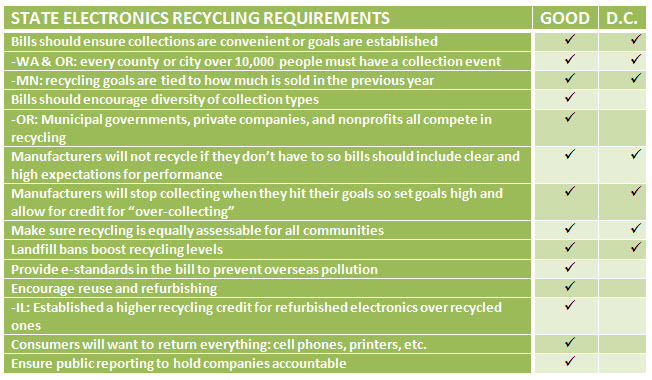 In order to accomplish this, the District places the responsibility on the companies that sell electronic goods to participate in electronic recycling programs. The biggest missed opportunity from our recently passed laws is that they do not encourage the companies collecting the electronics to prioritize District organizations and businesses for the refurbishing and recycling of these products. Without this piece, it can be predicted that most of the electronics will be sent to recycling centers out of the District. The District collected 137 tons of electronics last year at the Fort Totten Waste Collection Center, and it has the potential to collect 1,000 tons each year. The District should demand to benefit from the potential jobs and money that would result from localized recycling efforts. From here, DCEN, Institute for Local Self Reliance and others, will be looking into ideas on how to improve E-Recycling in the District. We will be meeting with recycling centers and nonprofits focused on computer refurbishing to get a better idea of the current e-recycling infrastructure in the District and nearby and how this can be expanded. We want to find ways to encourage and incentivize the wealth and jobs that e-recycling can provide to stay within the District. If you are interested in attending some of our upcoming E-Recycling Events or becoming involved, feel free to contact me at mhcruickshank@dcen.net . UPDATE: Our first e-waste recycling tour of the E-End electronic recycling facility in Frederick, MD is scheduled for November 3rd. 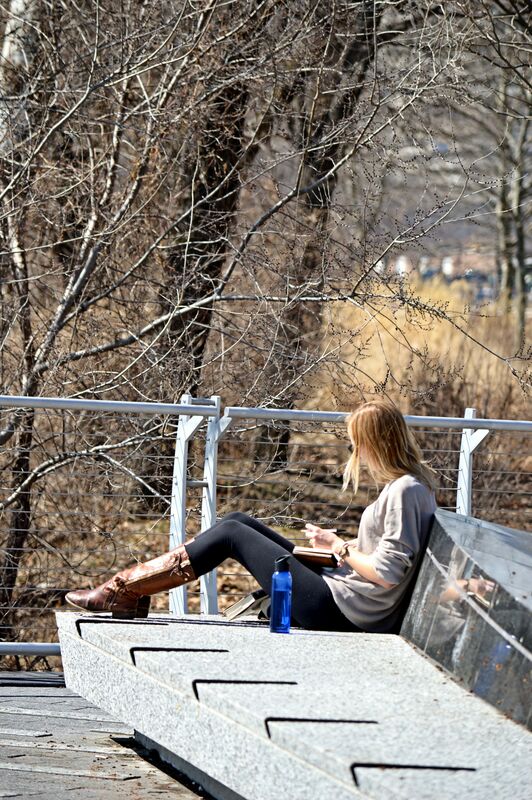 Biophilic DC Report w/Video & Next Meeting Info! The DC Environmental Network invites you to a special Biophilic DC organizing session to plan and build a DC Council resolution campaign coalition in support of our shared efforts to help District residents connect with nature. 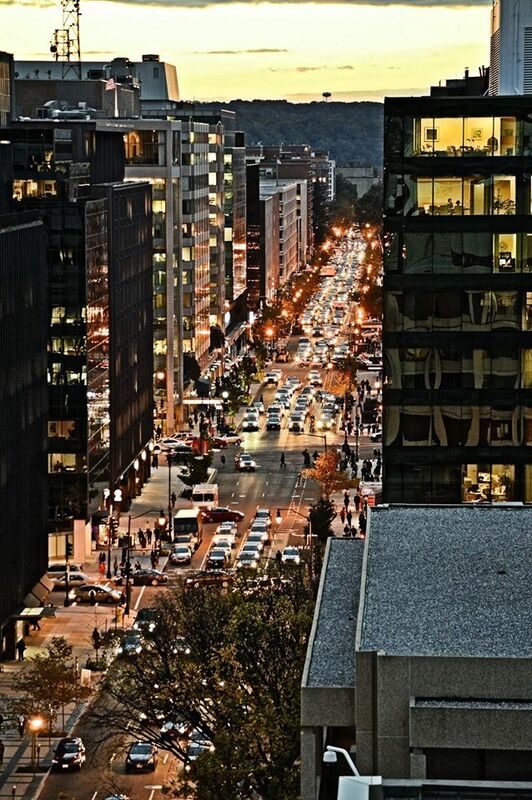 On October 2nd, the DC Environmental Network (DCEN) hosted a very special presentation and discussion on the international Biophilic Cities project. This opening event, featuring University of Virginia Prof. Tim Beatley and network members Stella Tarnay and Megan Draheim, introduced Biophilia to local environmental leaders (and others), many of whom are already promoting nature in the nation’s capital. Some of the organizations who came to share, listen and learn about this new initiative included the Alice Ferguson Foundation, American Bird Conservancy, Anacostia Unplugged, Anacostia Watershed Society, ANC 3D01, Casey Trees, City Wildlife, DC Climate Action, DC Environmental Network, DC Greenworks, Dumbarton Oaks Conservancy, Federal City Council, Friends of the Earth, Global Green USA/Green Cross International, Humane Society of the U.S., National Geographic Society, Old Growth Forest Network, Restore McMillan, SCRAP DC – Sierra Club, Washington, DC Chapter, Songbird Project, Summit Foundation, United for a Healthy Anacostia River, University of Virginia, Biophilic Cities Program, and Virginia Tech Center for Leadership in Global Sustainability. RSVP here for our October 30th Biophilic DC Campaign meeting. 1. Watch Professor Tim Beatley give an overview of the international Biophilic Cities network. 2. Here is Professor Beatley’s PowerPoint presentation. 3. Watch Stella Tarney and Professor Megan M. Draheim explore how the Biophilic Cities project principles are already connected to current District initiatives and community characteristics. Stella, Megan and I (and others) are forming a working group to consider a Biophilic DC resolution to put before the District of Columbia City Council in the near future. The purpose of this resolution would be two-fold. One, to join the list of cities around the globe that are part of the Biophilic Cities network and two, to increase awareness and support for the natural world that lives right next door to all of us. “A biophilic city is at its heart a biodiverse city, a city full of nature, a place where in the normal course of work and play and life residents feel, see, and experience rich nature–plants, trees, animals. The nature is both large and small–from treetop lichens, invertebrates, and even microorganisms to larger natural features and ecosystems that define a city and give it its character and feel. Biophilic cities cherish what already exists (and there is much, as we have already seen) but also work hard to restore and repair what has been lost or degraded and to integrate new forms of nature into the design of every new structure or built project. We need contact with nature, and that nature can also take the form of shapes and images integrated into building designs…” – Timothy Beatley, Biophilic Cities: Integrating Nature into Urban Design and Planning. The first Biophilic DC resolution campaign meeting will be on October 30th at Noon at the offices of the DC Environmental Network/Global Green USA, 1100 15th Street NW, 11th Floor. All are welcome. RSVP HERE and come help us educate our elected officials about the important connection between each one of us and nature and why promoting biophilic principles in DC can improve the health and happiness of our communities. The District of Columbia and surrounding region, and communities across the globe, face significant challenges to achieving the goal of increasing recycling rates and moving towards being a zero waste society. The District is going to have to engage on numerous fronts and will need both public and private approaches if we ever want to achieve the sometimes complimentary goals of improving the environment and creating jobs and new business opportunities in our city. On November 12th at Noon, at 1100 15th Street NW, 11th Floor, join the DC Environmental Network, and representatives of IMG Rebel, who will present on a new and exciting concept called “Recycle by Design”. Sign-up to attend and learn about this innovative concept that can help take our zero waste efforts to another level. This concept was inspired by the “Rebuild by Design” initiative that was a particularly successful response to the devastation caused by Hurricane Sandy in the greater New York Metropolitan area. The goals of IMG Rebel’s, Dutch inspired, “Recycle by Design” concept is to create a competition for discovering the best solutions for a complex and resilient problem. – Promoting innovation by developing regionally-scalable—but locally-contextual—solutions that increase recycling in a given region. The solutions in the selected proposals will be implemented with dedicated public and private funding. – Creating policy innovation by committing to set aside governmental funds and cooperation from governmental organizations to implement the best solution or group of solutions. There is no well formulated blue print for Recycle by Design, instead it is a tailor-made approach for each community. The purpose of this DCEN networking opportunity is to begin a conversation, led by IMG Rebel, to figure out what Recycle by Design might look like in the District of Columbia. Join the conversation by signing up here!